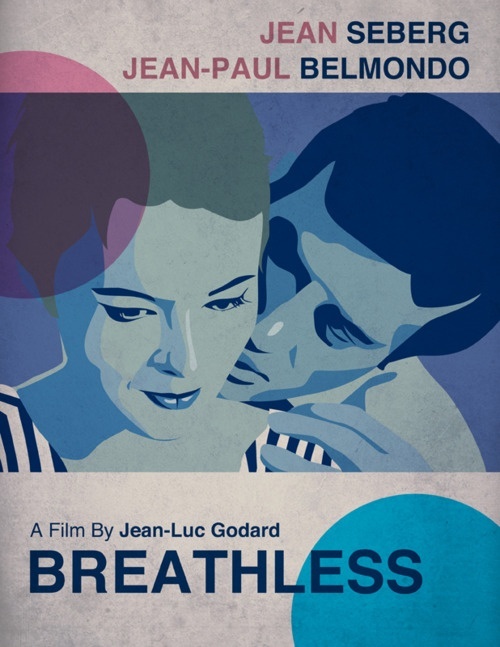 Breathless [À bout de souffle (1960)] features Jean-Paul Belmondo as Michel (alias Laszlo Kovacs), a small time Parisian criminal and Jean Seberg as Patricia, the young American woman who falls for him. Directed by Jean-Luc Godard from a story by François Truffaut, it’s revolutionary in terms of style and one of the most famous examples of France’s New Wave (La Nouvelle Vague). The New Wave typically used extensive location shooting and Breathless is no exception. In the opening sequence, Michel hot-wires a car in Marseilles as a jittery trumpet plays fitfully on the soundtrack. He ditches his female accomplice and pilots the American sedan onto the highway, talking back to the camera in a mocking voice. Any attempt to view the film literally is futile Godard seems to say. When cornered by a motorcycle cop, Michel shoots him with a loaded pistol he happened to find in the glove compartment. To the sociopathic con artist, the apparent killing (later confirmed in a newspaper article) is a mere reflex. It doesn’t faze him and he continues merrily back to Paris. Safe in another girlfriend’s flat, he treats her with indifference and steals a few francs from her purse. Our hero is a crook, a cad and possibly a murderer. When we first see the two leads together, Michel and Patricia are strolling down a tree-lined Paris boulevard while she hawks the New York Herald Tribune. Composer Martial Solal’s lush string orchestrations signal something romantic, but from what’s already transpired, we can sense danger. Patricia looks more magazine cover model than news vendor. In the world of the film, it’s normal that an American college girl is selling papers in the middle of Paris. This also gives her something to do in the scene. Without a care, Michel glides his way through the city. He obviously fancies himself as Humphrey Bogart with fedora and dangling cigarette. He even says as much at one point when he passes a theatre showing Plus dure sera la chute [The Harder They Fall (1956)]. This was when Bogart was resurgent on college campuses because of late night television. By 1940, Bogie mainly played good guys but apparently no one explained that to Michel. Despite the overwhelmingly positive tone of the nouvelle vague as series of series of idiosyncratic, Gallic hymns to American cinema, there were–unavoidably perhaps–a few dissonant tones. 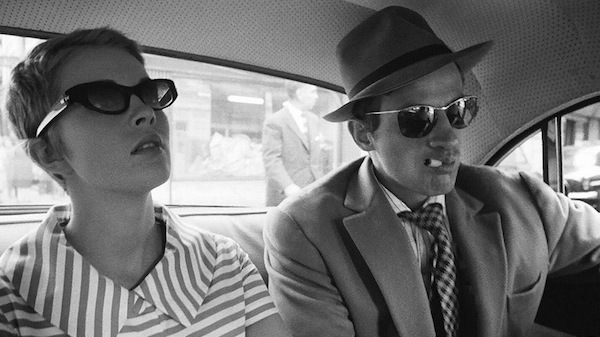 Though dedicated to Monogram Pictures and, on thje whole, nostalgically celebratory of modernity and American culture, Godard’s first feature, the anti-noir classic A bout de soufflé [Breathless (1960)] nonetheless displays elements of ambivalence and unease. À bout de souffle was Belmondo’s breakthrough. For director Jean Pierre Melville, he next played the titular role in the historical Leon Morin, Priest (1961), an even more cruel gangster in Le Doulos (1962) and a boxer/bodyguard in Magnet of Doom (1963). He then starred in Godard’s Pierrot le Fou (1965) again cast as the male half of a fugitive couple, this time with the director’s then wife Anna Karina. Jean Seberg’s film début was in Saint Joan (1957) directed by Otto Preminger and adapted by Graham Greene from a George Bernard Shaw play. Even with that illustrious pedigree, it failed at the box office. There was blame to go around but Seberg took the brunt of it. By the time she made Breathless, she had been in Bonjour Tristesse (1958) and the British The Mouse That Roared (1959), both somewhat more successful. After working with studio based directors, Godard’s experimental approach to cinema came as a shock. I don’t know if I’m unhappy because if I’m not free or if I’m not free because I’m unhappy. She rebelled against his unorthodox methods such as working without a script but was pleasantly surprised at the finished results. Of course, she had no idea that her character, a beatnik version of Audrey Hepburn in Coco Chanel inspired stripes, would become a style icon for generations to come. It could be argued that Jean Seberg was fashion’s first “it girl” of the 1960s. Jean-Luc Godard with Raoul Coutard and Jean Seberg. Coutard, who had previously shot only three quick films with Pierre Schoendöeffer, forged his quick, quirky signature style while improvising with Godard, who was not always clear or certain just what he wanted. “From day-to-day, as the details of his screenplay became more precise, he explained his conception: no [tripod] for the camera, no light if possible, traveling without rails . . . little by little we discovered a need to escape from convention and even run counter to the rules of ‘cinematographic grammar.’ The Shooting plan was devised as we went along, as was the dialogue.” . . . They decided also that Coutard should use the camera hand-held, perched on his shoulder, while seated in wheelchairs and even a mail pushcart in the backseat of a car, rather than conventional camera mounts. The goal was to capture a rough documentary quality, following the characters as if Coutard were a reporter out to get a story. John Dahl and Peggy Cummins as GUN CRAZY’s lovers on the run. There was a common misunderstanding among American art house snobs at the time that Godard’s genre references were dismissive and ironic. In Gun Crazy: The Origin of American Outlaw Cinema, author and historian Eddie Muller puts that to rest. Godard even dedicated his groundbreaking A bout de soufflé (1960) to Monogram Pictures, fiefdom of the King Bros. In America, many critics assumed the dedication to be an in-joke, the rigorously dialectical Godard cheekily giving a highbrow nod to cheesy Hollywood fare. Nothing could be further from the truth . . . Godard might have been thinking specifically of Peggy Cummins when he remarked, “All You need for a movie is a gun and a girl.” . . . Far from being a repudiation of Hollywood-style filmmaking, as many critics of the time claimed, A bout de soufflé was Godard’s attempt to translate the exhilarating effects of Gun Crazy and its noir kin to street-level, cinéma vérité productions. 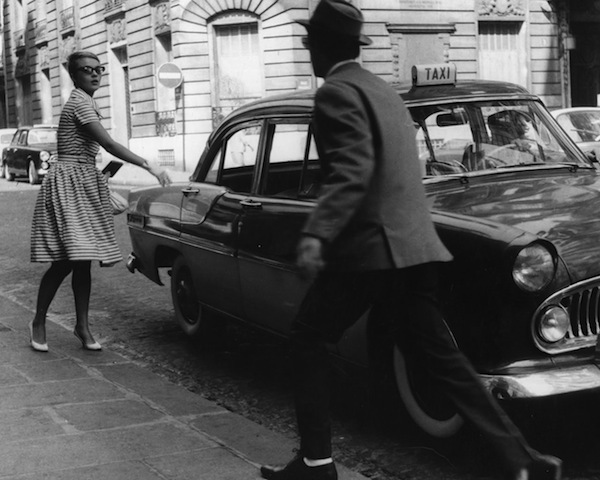 In the December 1962 Cahiers du Cinema, Godard writes: “In France, one can’t mix genres. In America, a thriller can also be political and include gags.” The slapstick of A bout de soufflé distinguishes it from the serious crime drama, French or American. As seen in news footage from the time, some French viewers leaving the cinema were put off by it. Still, the self-referential allusions and abundance of American genre film references must have been a treat for Godard’s fellow cinephiles. Jean-Paul Belmondo became an international star and appeared as the Legionnaire in the James Bond spoof Casino Royale (1967). Many consider his performance in the title role in Alain Resnais’ Stavisky (1977) one of the greatest in movie history. Godard cast Jean Seberg largely because of Preminger’s Bonjour Tristesse. Her ingenue with an attitude in that film was how Godard imagined his Patricia character. In the French Style (1963) directed by Robert Parrish, features Seberg as yet another free-spirited American abroad. For a complete review, click here. Finally, thanks to Summer, host of the France on Film Blogathon. She’s a teacher and dramaturg who blogs about “history, fashion, music, dance, performance, fine art, literature, cinema” at Serendipitous Anachronisms. Day One: French Cinema, French films for French audiences. Day Two: France as Subject, Films from any country, may take place in France or have French characters or French actors, French source material, or where France is significant. For a complete list of the entries, click on the banner.